Take investment strategy to the next level. The StockSnips Big Data analytics platform provides a competitive edge to understanding stock price changes by combining real-time news sentiment analysis to traditional price and volume signals. 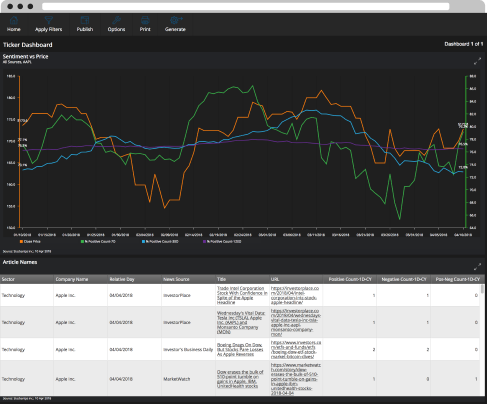 Automated (near) real-time news analysis further expands the universe of quantified data available to security analysts and enables a richer set of analysis for rapid and actionable changes to portfolios or trading strategies. Easy integration of other data sources and the ability to configure KPIs using the underlying data provides complete analytics with over a hundred reports and charts. Intuitive dashboards comparing your portfolio with sentiment derived for S & P 500, DOW 30 and NASDAQ COMPOSITE could be personalized without any coding efforts. Up-to-date sector-level analysis keeps you up to date on trends. Quickly and easily, you can get a high-level view of a sector or industry. 7-day price and sentiment allows for quick market price comparison. Quickly drill into a sector to find the sentiment and price breakdown for a period of time. Find what caused the shift in sentiment for any given company. Get granular with your data by looking up the positive or negative sentiment count for any day. Learn how our intelligent assistant platform can revolutionize your business.